Shows the embryonic beginnings of the Pacific Railroad. A New Map of the State of Missouri. 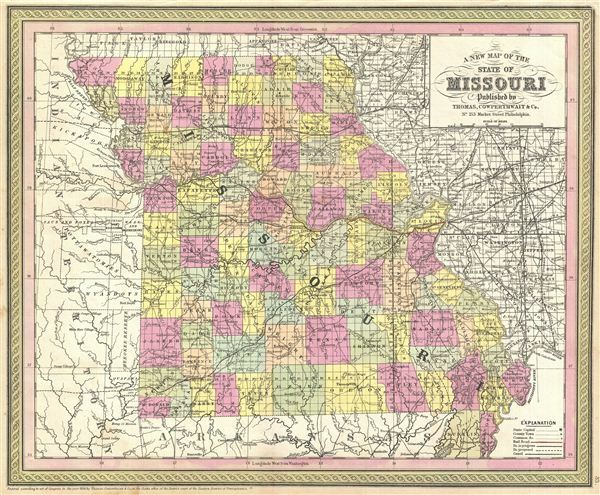 A fine example of Thomas Cowperthwait and S. A. MitchellÂ's 1854 map of Missouri. The map outlines with vivid detail counties, survey platting, towns, topography, and one railroad route from St. Louis to Jefferson City. This fledging railroad route is in fact the beginnings of the Pacific Railroad which, in the course of the next two decades, would make its way westward to Sacramento, becoming AmericaÂ's first transcontinental railroad. This map was drawn during the heated dispute that eventually led to the Missouri Compromise of 1850, thus postponing the inevitable hostilities Civil War by about 10 years. The whole is engraved and colored in MitchellÂ's distinctive style with green border work and vivid pastels. Political and topographical features are noted and color coded with elevation rendered by hachure. Rumsey 0537.031 (1846 edition). Phillips (Atlases) 814.